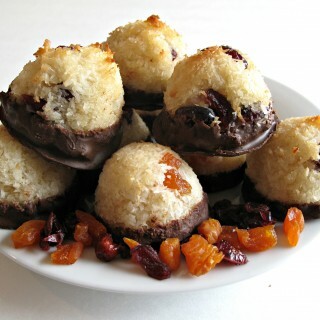 This is the sixth recipe in The Monday Box week of Time Saver Recipes. All of the recipes in this series are quick and easy, using cake mix or refrigerated cookie dough as a shortcut ingredient. 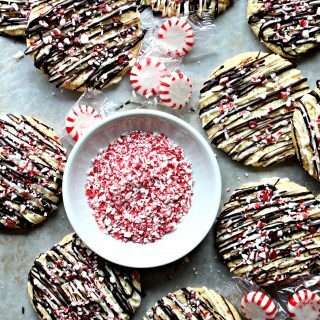 Peppermint Crunch Cookies start with a regular roll of refrigerated sugar cookie dough, but with a few tweaks, end up extraordinary. I was both surprised and delighted to find that Peppermint Crunch Cookies tasted as good, or better, a week after baking! The cookies gain a crisp crunch that is like “cookie bark”. That makes Peppermint Crunch Cookies an excellent make-ahead treat for holiday gatherings and gifts. They are also a good choice for peppermint care packages** (see shipping note below)! **Storage and shipping note: Peppermint is a strong flavor and scent. Very little peppermint extract flavors an entire batch of cookies. That one batch of cookies can add peppermint flavor to other cookies if not stored separately. For care packages, wrapping different flavors of cookies in plastic isn’t enough. The peppermint flavor can even sneak through plastic storage containers! When I send peppermint cookies, I use a peppermint theme where everything in the box is peppermint flavored! Don’t miss the other Time Saver Recipes in this series. 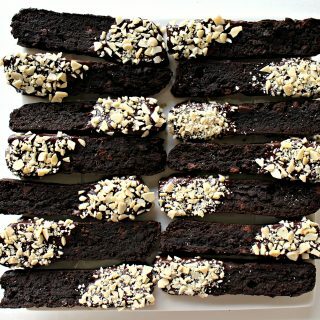 Chocolate Covered Cherry Bars, Cinnamon Chip Biscotti, Gingerbread Spice Cookies, Butterscotch Blondie Bars, and Mocha White Chocolate Biscotti are sure to bring smiles to everyone who tastes them! Check back tomorrow for the final Time Saver Recipe! In a medium mixing bowl, using a spoon or rubber spatula, combine the cookie dough, peppermint extract, and white chocolate chips. Use a small scoop (1 tablespoon) to portion the dough onto the prepared baking sheet about 2” apart. Bake for 9-11 minutes or until edges begin to turn golden. Cool on the baking pan for about 5 minutes, then transfer onto wire racks to cool completely. 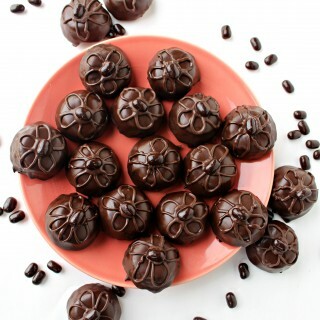 To decorate: Put the cooled cookies onto a baking sheet lined with wax paper. Melt the white and dark chocolate in two separate bowls. 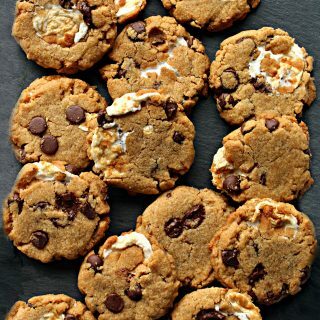 Using a small spoon, drizzle the white chocolate, then dark chocolate onto 4 cookies. 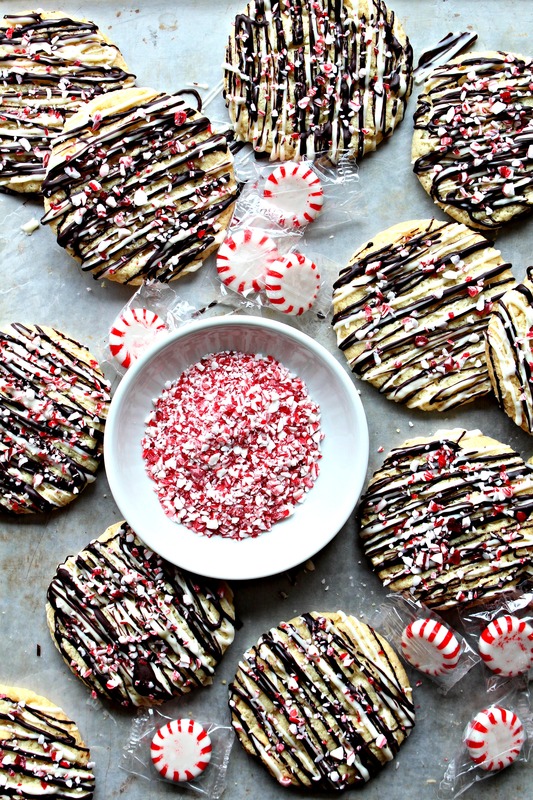 Sprinkle with peppermint bits. Repeat, until all of the cookies are decorated. 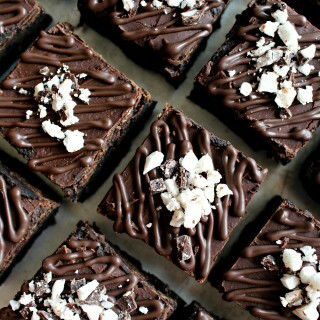 Refrigerate for 5 minutes, until the chocolate is set. 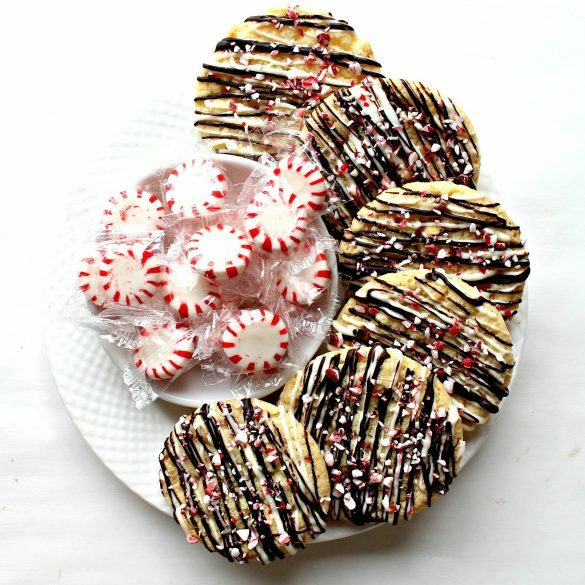 Store Peppermint Crunch Cookies in an airtight container at room temperature for up to 10 days. These cookies get crunchier over time. Wrap pairs of cookies, bottoms together, in plastic wrap. Stack wrapped bundles in an airtight container or freezer weight ziplock bag. Ship peppermint flavored baked goods separately from other baked goods. Wendy, these look wonderful. 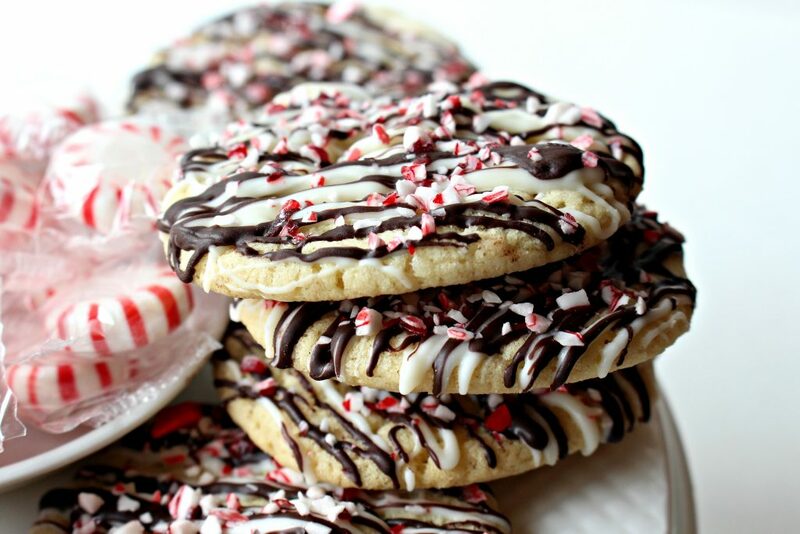 I love peppermint and chocolate together and try to get as much as I can of it during the holiday season.. Even though it’s a favorite, it doesn’t quite seem right at other times of the year. 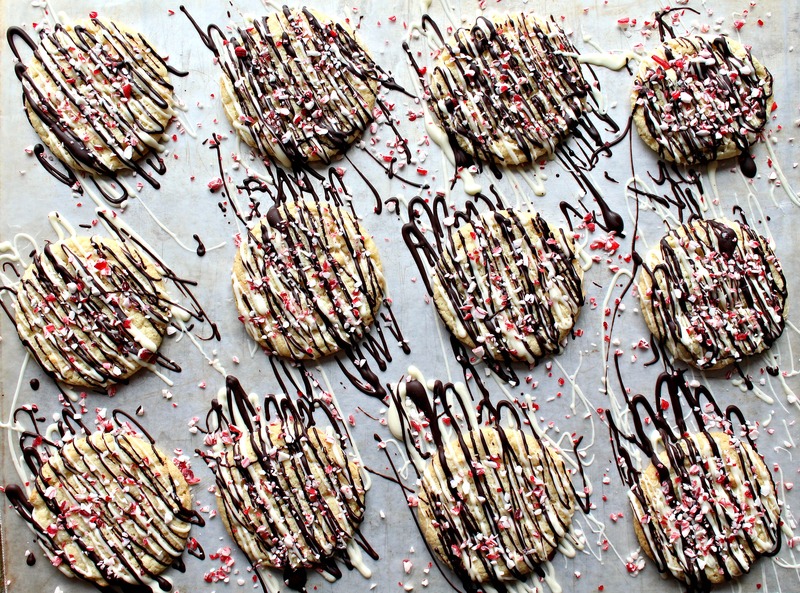 :) I’m actually doing some peppermint chocolate chip cookies right now. Do you have any special trick for crushing your peppermint so nicely? What a great idea for these awesome cookies and so easy! Hope you have a fantastic weekend and thanks so much for sharing with us at Full Plate Thursday! Thanks, Miz Helen! Everybody needs a little “easy” right now! 🙂 Enjoy your weekend and your company! Thanks, as always, for hosting Full Plate Thursday! I love peppermint and am so excited to try these. 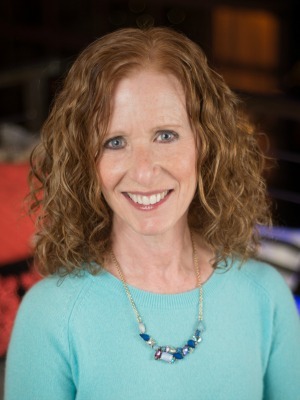 Thank you so much for sharing on Link Party Palooza. Thanks for pinning, Kippi! 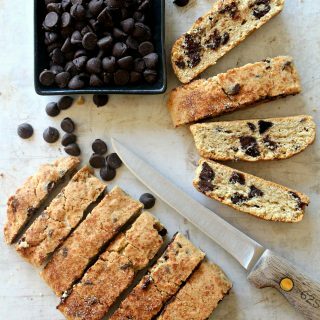 This cookie is a real time saver and yummy too. I hope you get to try it. Happy New Year! These re gorgeous! Pinning to share! Beautiful cookies! Visiting from the Pretty Pintastic party and pinning! Have a great week.